As discussed yesterday, a brief trip on Lyon Street leaves one in disgust. Councillor Holmes has expressed reservations at the thought of resurfacing Lyon, as she feels it might result in the loss of the speed humps along Lyon street. But something must be done. Is there any hope for Centretown? The speed humps on Lyon are definitely a force of good. With the street ending after Catherine, it is a one-way, multi-lane freeway onramp that stretches all the way back to Wellington. Most of the drivers using it are thinking about getting from their downtown jobs to their suburban homes--and not of the community they are motoring through. If you've ever tried to cross Lyon at one of the many small streets where Lyon doesn't have any traffic controls, you'll agree that the speed humps are a boon. On multiple occasions, people attempting to cross Lyon on MacLaren collided with these suburban Keener-Careeners coming own Lyon. The result was terrifying for those in the house on the south-west corner of the intersection. So what does this history lesson on the big humps have to do with eliminating the little bumps? Well, Councillor Holmes and the community had to fight hard to get those speed humps installed, and they don't want that effort to go down the tubes. But speed humps are not built like the rest of the street. Whether the street was just recently built, or whether it's ten years old, speed humps are always installed afterwards: A key is cut out of the top layer of the flat asphalt, (specifically, "4 meters in length and 80 millimeters in height with a sinusoidal cross-section"), then paved over. 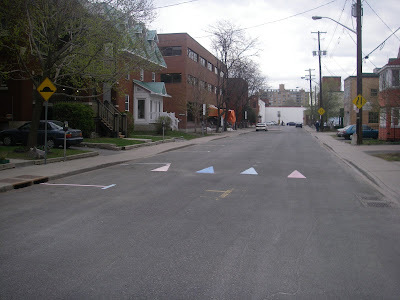 A few signs are put up, and triangles are painted with white retroreflective paint as an indicator to drivers. The upshot is that it doesn't have to be designed into the road, and thus you don't have to wait for the next major reconstruction to install new ones. But the painful downside is that the additional cost of installing them is the same, whether the road was last resurfaced ten years ago or ten days ago. (IIRC, the cost is about ten grand per hump). Recently in my daily travels, I saw that Gilmour was being resurfaced East of Elgin in the Golden Triangle. To my utmost surprise, the speed humps were left intact during the reconstruction! This meant that Lyon could also be repaved without threatening our beloved traffic-calming measure! As clean and crisp as the new sidewalk looks, I'm sure that in no time it will be looking as dull and broken up as its predecessor. Why are we paving the sidewalk with asphalt again? Never mind, I'm sure it was to save money. I hope this brings us one step closer to fixing Lyon! When travelling in Centretown between home and work, I often must take Lyon street. This one does with all the pleasure of riding a bicycle down a flight of stairs. For whatever reason, Lyon Street keeps developing terrible potholes, and the myriad patch jobs applied never really solve the problem. It was no help last year when the construction of a condo building in the business district (pictured below) involved the intersection of Lyon and Laurier getting dug up with many holes, each patched separately--and poorly--leaving a crumbling quilt on which to quiver. The developer should not have been allowed to get away with leaving our roads in such a deplorable mess. But my daily beef relates to the stretch between Somerset and Gladstone. It's like a cancer on the road. Every week there are big new potholes, and every week the City puts some filler in them--adding bumps to nature's holes. The turn from James is perhaps the worst. Each time I make the turn, I gingerly negotiate the potholes in order to mitigate the effects of the impromptu shiatsu beating that awaits my hindquarters. Riding on the right side of the street is impossible, but so is riding just about anywhere else for any distance. They seem to have done a reasonable job just South of Gladstone, covering two-thirds of a stretch of potholes with a pair of medium-size squares--but that is hardly enough. I raised this issue with Councillor Holmes a couple of weeks back. I told her that Lyon desperately needs to be repaved. She did not immediately embrace the idea, as she doesn't want to lose the speed humps which slow traffic as it careens toward the freeway onramp. Tune in tomorrow afternoon, Tuesday, July 29 for the exciting sequel: Lyon Street, Part II: A Golden Triangle of Hope! In the suburbs, they need permission to leave stuff out on the side of the road for people to take away for free. Well, not so much "permission" as special days with special rules to leave stuff out on their lawn. Not so in Centretown, where every weekend brings a new trove of perfectly useful things left at the curbside for the unprudish. This weekend was no exception. One household (whose house was under renovation) had a garage "sale"--without the "sale". They just left a bunch of stuff out in the driveway with a sign saying "free". Come to think of it, they might not have a garage, either! I picked up a couple of shelf brackets, a game of Trivial Pursuit, and some toys for a friend's children. Another man checking out the scene picked up a jacket that fit him quite well. I'm still recovering from Bluesfest, and still easing back into my regular routine. From Monday to Thursday I slept every minute I wasn't at work, so catching up from the fallout of that meant blogging had to wait. Another aspect of my routine is going to the Ottawa Farmer's Market at Lansdowne Park (admittedly, also not in Centretown. I'll get back to Centretown photos after this post). This summer, they're also open on Thursdays from 2pm-7pm. In the extremely unlikely event you haven't heard already, the South side stands at Frank Clair Stadium were deemed unsafe a while back, and today was the day they decided to demolish it. Last week at the water cooler, one of my colleagues was happy to hear this news: "Good. Back in the '70s they built this ugly thing overtop the South stands, so I'm glad to hear it's being demolished." I had to break the bad news that this monstrosity was being retained, and only the lower stands were being demolished. The Citizen has a decent writeup and photo gallery of the demolition. The City of Ottawa has a video of the demolition, which lasts all of a few seconds, followed by the dust settling for a minute. It's quite interesting to see that the stands were built of a frame of concrete posts atop which were placed fairly loosely some large concrete blocks for the steps, which topple away like an upended box of matchsticks in the video. Yep. That's rubble alright! Here two backhoes were waiting for the 10-14 days of clearing up they've got ahead of them. You can see some engineers in the far background on the other side of the fence. Here we can see the rubble and the upper South side stands, plus the canopy and lights above it. I think the concrete zigzag pattern is actually quite neat in the framework, though I wouldn't have one of these things installed in my backyard just for that feature. Is it just me, or is the nearmost pillar sorta crooked? I was able to get this shot thanks to a conveniently-placed pile of disassembled metal scaffolding behind the South wall. Considering I was spending most of my attention balancing on top of the piece of railing, I'm fairly pleased at the photo. Well, that's about it. Is anyone aware of any previous controlled implosion in Ottawa? It certainly isn't a very frequent occurence. I'm at Bluesfest all week, which is why I haven't been posting much. I had noticed earlier that there were some Jersey barriers and chain link fence blocking off access to Pooley's Bridge. This bridge was a part of the pathway through Lebreton Flats until the path was realigned along the Ottawa River, but it remains a useful connecdtion. In the photo below, we can see that the bridge, and the pathway below it, are both closed off. While running an errand during Bluesfest, I saw hundreds of people climbing over the fence to get to Bluesfest. This is obviously a problem, and I've been spending what little spare time I have during Bluesfest to track down the appropriate person to clear the way. It's only a matter of time that someone falls while climbing over it. Further along, this view on the pathway heading out there was just too good to pass up. Note the green field, the blue sky, the building, and the clouds nicely lined up in the background. The shipping containers at the bottom store kayaking equipment.